EAST RUTHERFORD, NJ–The Packers were down by 14 points, 20-6, heading into the fourth quarter of Sunday night’s game against the Giants at MetLife Stadium. Scott Tolzien’s 29-yard pass to Jordy Nelson on the Packers’ first drive of the second half put the Packers across midfield, but two plays later Tolzien was intercepted by linebacker Jon Beason and the Giants were in business at the 50-yard line. Immediately, Eli Manning connected with Hakeem Nicks on a 35-yard pass. The drive stalled, however, and the Giants had to settle for a 28-yard field goal that gave them a 13-6 lead with 10:06 to play in the third quarter. Mike McCarthy, in another bold special teams move, ordered a fake punt on fourth-and-seven at the Giants 43-yard line. The Packers came up a yard shy of the first down at the Giants 37-yard line with 6:32 to play in the third quarter. Manning found Victor Cruz down the right sideline for 25 yards to the Packers 32-yard line. Micah Hyde was in coverage. Two plays later, Manning hit Cruz over the middle for 14 yards to the 16. On third-and-five, Manning pitched a strike to Brandon Myers for a first down at the 3-yard line. Two plays later, Brandon Jacobs scored from a yard out. EAST RUTHERFORD, N.J. — K Mason Crosby ended the first half with a 57-yard FG to pull the Packers within 10-6 at intermission. The Packers took over on their own 37-yard line with 43 seconds left in the half. Passes of 9 yards to WR Jarrett Boykin and 15 yards to WR Jordy Nelson, followed by a spike with 5 seconds left, set up the kick for Crosby. It’s the longest outdoor field goal in club history and the second longest overall, one yard shy of Crosby’s 58-yarder at the Metrodome in 2011. The Giants began the quarter by getting a 40-yard field goal from Josh Brown to make it 10-0. A 30-yard pass to WR Victor Cruz on third-and-7 got the drive going. New York then converted a fourth-and-inches at the Green Bay 36 on a run by RB Brandon Jacobs. On the next series, the Giants faced fourth-and-short again, but elected to kick. The Packers answered with a field goal of their own. QB Scott Tolzien hit passes of 25 yards to Nelson and 45 yards to WR James Jones to get the ball in the red zone, but the drive stalled there. Crosby kicked a 24-yard FG. That red-zone failure made the Packers just 1-of-7 in scoring TDs in the red zone since QB Aaron Rodgers’ injury. The Packers defense thwarted the Giants next drive after a 74-yard march. Another fourth-and-short conversion by Jacobs got New York into scoring range. But on third-and-11 from the 15, CB Tramon Williams made a diving interception of a pass that was thrown behind WR Louis Murphy Jr., and the Packers remained within seven points. 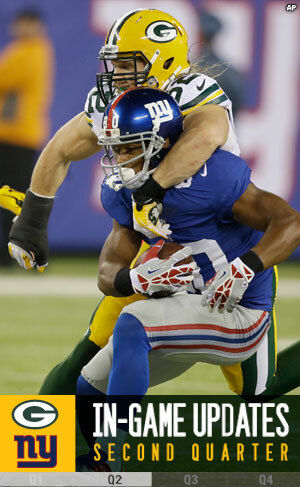 EAST RUTERFORD, NJ–The Packers trailed the Giants, 7-0, following a quarter of action at MetLife Stadium on Sunday. The Giants took a 7-0 lead on a 26-yard pass from Eli Manning to Rueben Randall with 5:34 to play in the first quarter. It capped a five-play, 42-yard drive. One of the big plays in the drive was a third-and-five run by Andre Brown that gained 10 yards and a first down at the Packers 27-yard line. Micah Hyde was in coverage on the Manning-to-Randall touchdown play. On the Giants’ next possession, Manning completed a 30-yard pass to Victor Cruz to move the Giants to the Packers 45-yard line. The Giants faced a fourth-and-inches at the Packers 36 and Brandon Jacobs burst through a big hole over left guard for a first down at the 31. That’s where the ball was when the quarter ended. Packers fans got good news shortly after kickoff: Pittsburgh rallied to beat the Lions, who are now 6-4. With a win, the Packers would move into a first-place tie. – Green Bay (5-4) heads east in Week 11 after back-to-back home games to face the N.Y. Giants (3-6), the third straight season that the teams have squared off at MetLife Stadium. – Today’s game was originally scheduled to be a prime-time matchup, but was shifted to a late-afternoon time slot through the league’s flexible scheduling. – The Packers will be looking to snap a two-game losing streak after falling to 5-4 on the season with a loss to Philadelphia at Lambeau Field last Sunday. Green Bay is tied for second in the NFC North with Chicago (5-4), one game behind first-place Detroit (6-3). – The last time the Packers played a team outside of their division on the road in three-plus consecutive seasons was when they visited the Philadelphia Eagles each season from 2004-06. – This will be the fourth straight season that the Packers and Giants have faced off in the regular season, the first time that has happened in the series since 1980-83. – It is also the fourth straight year that the Packers have played at MetLife Stadium, with games against the Giants in 2011 and 2012 and a Week 8 meeting with the N.Y. Jets in 2010, the stadium’s first season. – This marks the fourth straight season (2010-13) that the Packers have had a record above .500 through nine games. – Green Bay has won two straight road games entering today’s contest, with victories at Baltimore in Week 6 and Minnesota in Week 8. Including playoffs, the Packers have won 16 of their last 24 road games (.667). – Two of the most venerable franchises in professional football history, the Packers and Giants have combined for 21 championships. Green Bay ranks No. 1 among all franchises with 13 titles, while the Giants check in at No. 3 with eight championships behind Chicago (nine). – The Packers and Giants have squared off in five NFL championship games, with Green Bay winning four of those contests. New York won the 1938 title at the Polo Grounds in New York, but the Packers defeated the Giants in the championship game in 1939, 1944, 1961 and 1962. – Green Bay holds a 31-25-2 edge in the all-time series, which includes a 4-3 postseason record. The teams first met in 1928 in New York. – This will be the second straight week that the Packers have faced an NFC East team, with Green Bay hosting Philadelphia last Sunday. The Packers played Washington at Lambeau Field in Week 2 and will travel to Dallas in Week 15. – The Packers enter today’s contest with a 33-10 record in their last 43 regular-season games, a .767 winning percentage that ranks No. 2 in the NFL over that span behind only New England (34-9, .791). – Today’s officiating crew includes referee Terry McAulay (77), umpire Scott Dawson (70), head linesman Greg Bradley (98), line judge Mark Steinkerchner (84), field judge Terry Brown (43), side judge James Coleman (95) and back judge Lee Dyer (27). As per team tradition, the Packers select game captains each week. Today’s captains will be FB John Kuhn (offense), DT B.J. Raji (defense) and CB Micah Hyde (special teams). – The Packers have posted at least 350 yards of offense in 10 of their last 11 regular-season games. – Green Bay has posted 3,780 yards of offense this season, the most through nine games in franchise history. The Packers rank No. 3 in the NFL through Week 10 with their average of 420.0 yards per game. – Green Bay has rushed for 135-plus yards in six of its last eight contests. The Packers’ 1,288 rushing yards this season are the most through nine games since 2003 (1,475 yards) and the fourth most by the club through nine games since the 1970 AFL-NFL merger. – The Packers have had at least one 100-yard receiver in seven of nine games this season and rank No. 1 in the NFL with nine 100-yard receivers on the season. – Green Bay’s nine 100-yard receivers this season are tied for the third most in a season in franchise history, trailing only the 11 in 1995 and the 10 in 2010. – Over their last four games, the Packers have converted 28 of 56 third-down opportunities, a 50.0 percentage that is tied for No. 3 in the NFL over that span. – The Packers have averaged 28.0 points per game on the road since 2011, No. 2 in the NFL over that span behind only New England (31.6). – Green Bay has turned the ball over five times in its last six games. – The Packers have been flagged for 11 penalties in their last three games. – With QB Scott Tolzien expected to start today, it will mark the first time since 1987 that the Packers have had a different QB start in three consecutive games in a season. That season, Randy Wright started Week 1, Don Majkowski opened in Week 2 and Alan Risher started in Week 3 (replacement game). The last time prior to 1987 that the Packers had a different QB start in three straight games was in 1973 (Jim Del Gaizo, Scott Hunter and Jerry Tagge). – RB Eddie Lacy has rushed for 618 yards over the last six games, No. 1 in the NFL over that span. – Lacy needs one rushing TD to move into a tie for the second-most TD runs in a season by a rookie in team history. With four on the season, Lacy is one behind Charles Goldenberg, Gerry Ellis and Brent Fullwood (five each) and two behind Samkon Gado (six). – In three career regular-season games against the Giants, WR Jordy Nelson has posted a 28.9-yard receiving average, catching 10 passes for 289 yards and two TDs. His two TDs against the Giants were an 80-yard score in 2010 and a 61-yarder in 2012. – Nelson has 11 catches of 25-plus yards this season, which is tied for No. 2 in the NFL through Week 10. – WR Jarrett Boykin has 319 receiving yards since Week 7, which ranks No. 9 in the NFL over that span. – In two career regular-season games against the Giants, LB Clay Matthews has posted a sack, two forced fumbles and a 38-yard INT return for a touchdown. – LB A.J. Hawk enters today’s game with 964 career tackles, good for No. 5 in team history (since 1975). He is just four tackles shy of moving past LB Mike Douglass (967, 1978-85) for No. 4 on the club’s all-time list. Hawk leads the team with 92 tackles this season, eight shy of his fourth straight 100-tackle campaign. – DE Datone Jones has posted three sacks over the last two games, tied for No. 1 in the NFL over that span. – K Mason Crosby ranks No. 3 among NFL kickers with 89 points this season. He is 11 points shy of his seventh 100-point season. He ranks No. 2 in team history behind only Ryan Longwell (eight, 1997-2004).